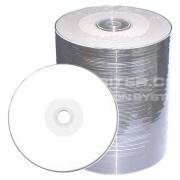 Taiyo Yuden Thermal, Everest/Teac White Hub Printable DVD-R is rated at 16x. With smooth white top print surface, no stacking ring. Holds up to 4.7GB of data. Comes in 100 pieces, tape wrapped, no spindle. Taiyo . Yuden . 16X . White . thermal . printable . DVD-R . for . Everest . Shrink . Pack . of . 100 .